2012 Takisawa NEX-110 CNC Turning Center s/n CM10N10623 w/ Takisawa Turn-i-FANUC Controls, 10-Station Turret, 3500 Max RPM, Hydraulic Tailstock, 10” 3-Jaw Power Chuck, Chip Conveyor, Coolant. 2008 Takisawa NEX-110 CNC Turning Center s/n CI09N10083 w/ Takisawa Turn-i- FANUC Controls, 10-Station Turret, 3500 Max RPM, Hydraulic Tailstock, 10” 3-Jaw Power Chuck, Chip Conveyor, Coolant. 2007 Takisawa EX110 CNC Turning Center s/n CH08E11135 w/ Fanuc Series 21i-TB Controls, 10-StationTurret, 3500 Max RPM, 2 7/8” Thru Spindle Bore, Hydraulic Tailstock, 12” 3-Jaw Power Chuck, Chip Conveyor, Coolant. 2006 Takisawa EX110 CNC Turning Center s/n CG06E10904 w/ Fanuc Series 21i-TB Controls, 10-Station Turret, 3500 Max RPM, 2 7/8” Thru Spindle Bore, Hydraulic Tailstock, 12” 3-Jaw Power Chuck, Chip Conveyor, Coolant. 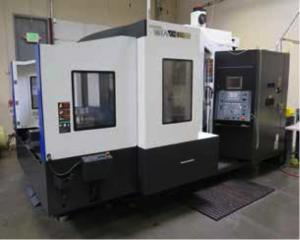 2013 YCM NXV1020A CNC Vertical Machining Center s/n 0065 w/ Fanuc MXP-200FA Controls, 24-StationATC, CAT-40 Taper Spindle, 12,000 Max RPM, Travels “X”=40”, “Y”=20”, “Z”=20”, Chip Augers, ChipConveyor, Coolant. 2006 YCM XV1020A CNC Vertical Machining Center s/n 1261 w/ Fanuc MXP-200i Controls, 24-StationATC, CAT-40 Taper Spindle, 10,000 RPM, Rigid Tapping, Hand Wheel, Travels “X”=40”, “Y”=20”, “Z”=20”,Chip Auger, Oil Skimmer, Coolant. 2006 YCM XV1020A CNC Vertical Machining Center s/n 1260 w/ Fanuc MXP-200i Controls, 24-StationATC, CAT-40 Taper Spindle, 10,000 RPM, Rigid Tapping, Hand Wheel, Travels “X”=40”, “Y”=20”, “Z”=20”,Chip Auger, Oil Skimmer, Coolant. 2004 Sharp SV-2412S CNC Vertical Machining Center s/n 30100199 w/ Fanuc Series 0i-MATE- MB Controls, 16-Station ATC, CAT-40 Taper Spindle, 8000 Max RPM, Hand Wheel, Travels “X”=24”, “Y”=12”,“Z”-12”, Chip Conveyor, 12” x 27 ½” Table, Coolant. 2012 CAM Five mdl. CFL-CMA 1080K 4-Axis CNC Laser Engraving Machine s/n 60543 w/ 80 Watt CO2 Laser, 4000 DPI Resolution Ratio, 39” x 31” x 8” Work Envelope, 4 th Axis Rotary Attachment with 6” x 20” Cap., CAM Five SL-1D Laser Chiller, Exhaust Blower, Laser Pointer, Smart Carve 4 and CAD Tool Software. Chiller, Dual Chip Augers, ChipConveyor. 2001 Kia Center H63 2-Pallet 4-Axis CNC Horizontal Machining Center s/n KH930187 w/ Fanuc 18-M Controls, 60-Station ATC, CAT-50 Taper Spindle, 3500 Max RPM, Hand Wheel, Rigid Tapping, 4 th Axis 90Degree Indexing Thru Pallets, (2) 24 ¾” x 24 ¾” Pallets, Dual Chip Augers, Chip Conveyor, Coolant. 2000 Saleo MACH 3 2-Pallet 4-Axis CNC Horizontal Machining Center s/n 3K41200074 w/ Fanuc Series 0-M Controls, 16-Station ATC, CAT-40 Taper Spindle, 8000 Max RPM, 4 th Axis 90 Degree Indexing ThruPallets, (2) 12” x 12” Pallets, Coolant. 2014 YCM NSV1020A 4-Axis CNC Vertical Machining Center s/n 0815 w/ Fanuc MXP-200FB Controls, 40-Station ATC, CAT-40 Taper Spindle, 12,000 Max RPM, Hand Wheel, Travels “X”=40”, “Y”=20”, “Z”=20”,Harbor Oil Cooler, Tramp Oil Skimmer, Dual Chip Augers, Chip Conveyor, 25 ½” x 44” Table, Coolant. 2000 Hwa Cheon Hi-TECH 100BC CNC Turning Center s/n M01234H5FA w/ HYD-3000T Controls, 12-Station Turret, 6000 Max RPM, Hydraulic Tailstock, Parts Catcher, 10” 3-Jaw Power Chuck, 16C Collet Nose, Coolant, LNS Quick Load Automatic Bar Loader / Feeder s/n 18430. 2003 Kia “Super Kia Turn 15” CNC Turning Center s/n SKT150759 w/ Fanuc Series 0i-T Controls, Tool Presetter, 12-Station Turret, 6000 Max RPM, Hydraulic Tailstock, 6 ½” 3-Jaw Power Chuck, 16C Collet Nose, Chip Conveyor, Coolant. 2013 Zeiss Contra G2 10/16/6RDS CMM Machine s/n 201310504034 w/ Zeiss RDS-CAA Multi-Axis Probe Head, Zeiss VAST XXT Tip Head, MSR mini 9-Station Multi Sensor Probe Sensor Rack, Zeiss IMT GmbH /BP26_SE Joystick Controller, RRFixtures Inc 36” x 39” Tapped-Hole CMM Fixture Plate, Zeiss CALYPSO 2014 Software, Contra G2 Auto Stylus System Change Software Package. Starrett HGC3024-18 CMM Machine s/n B-1541 w/ Renishaw MIP Probe Head, 30” x 24” x 18” Work Envelope, 33” x 38” x 6 ½” Granite Table, Apogee 3D Control Software. 2007 Makino mdl. SP43 4-Axis CNC Wire EDM Machine s/n W7486 w/ Makino MGW-S5 Controls, Hand Controller, 0.015mm Repeatability and Accuracy, 0.2mm 0.25mm 0.3mm Selectable Wire Electrode Diameter, +- 35 Degrees / 100mm Plate Thickness Max Taper Angle, 12 ½” x 18 ½” Open Work Area, Dielectric Coolant Filtration and Chilling Unit. Controls, System 3R 3Robotics 9-Station Tool Changer, System 3R Rotary “C” Axis, Hand Controller, Coolant Filtration and Cooling Unit, 13 7/8” x 19 5/8” Table. 1991 Mitsubishi M25J CNC Plunge EDM Machine s/n 002J7080 w/ Mitsubishi JC7G35Controls, System 3R Rotary “C” Axis, Hand Controller, Coolant Filtration and Cooling Unit, 13 7/8” x 19 5/8” Table. w/ Ingersoll RandControls, 125 CFM @ 125 PSIG, 5054 Metered Hours, Tank. w/ Ingersoll Rand Controls, 55 CFM @ 125 PSIG, 120 Gallon Tank, 22,564 Metered Hours. 2012 Everlast IGBT PowerPRO205 Inverter Welder 3-In- 1 TIG/MMA/ Cut s/n 695701121. 1999 Vectrax mdl. JL-618M 6” x 18” Surface Grinder s/n 11808 w/ Suburban 6” x 18” Magnetic Chuck,Wheel Dresser, Coolant. Darex mdl. XT3000 Precision Drill and Tool Sharpener w/ Accessories. (2) Haas 4 th Axis 5C Rotary Indexers w/ Haas Servo Controllers. Yuasa mdl. 111005 4 th Axis 5C Rotary Head. (2) Chick 4” Double-Lock Quad Vise Tombstones w/ 12” x 12” Pallet Bases. (3) Chick 4” Double-Lock Vises. (200) CAT-40 Taper High Speed Balanced and Standard Tooling. (2) Huot Super Scoot 50-Taper Tooling Carts. (3) Huot 40-Taper Tooling Racks. ER Punch Former Precision Spin Fixture. (2) Lista 9-Drawer Tooling Cabinets. Huot Drill and Reamer Cabinets.